To be honest, I was not really looking forward to fall – colder weather, school carpools and homework, waning daylight – and then I remembered how much I love braising. Braising is a cooking method that involves long slow cooking of various kinds of meats in some type of liquid. 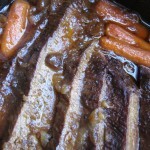 If you love your slow cooker, you will love braising. And braising goes with fall just like big pots of steamy chicken soup do. 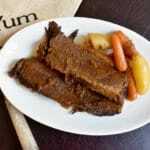 Brisket is ready to eat, or refrigerate, or freeze! The other aspect of fall I love is celebrating the Jewish New Year, Rosh Hashanah, with friends and family. Each year, we have a large gathering at our home (remember The Battle of the Blintz?) to ring in a sweet new year. Usually, my mother prepares the brisket, but this year, I stepped in to help and to learn. You see, my mother makes the BEST BRISKET. I continue to try other recipes, but her platter is always empty first. It’s the pinnacle of brisket-making that we all strive for, but generally fall a little short. 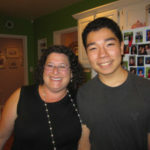 Since I am determined to not let my mother’s recipes remain undocumented, as my grandmother’s were, I am sharing the recipe here and have also decided to start a recipe book just for our Rosh Hashanah gathering – pulling together all the mouth-watering recipes of the food contributed each year. 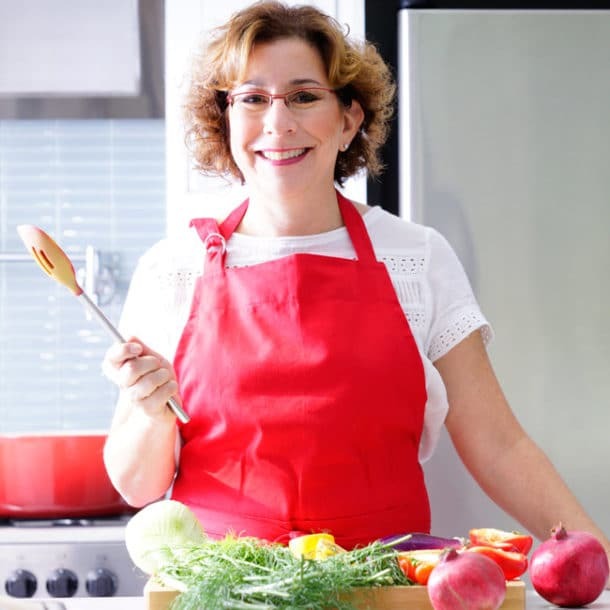 I am doing the same for Passover but here on my blog – be sure to check out my complete guide to Passover recipes for your seder meal. As for the origin of my mother’s brisket recipe – she thinks (not 100% sure) that she got it from her sister Trudy who was an excellent savory cook. 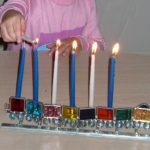 Everyone wanted to be invited to her holiday gatherings – especially for Hannukah and her crispy potato latkes, served with brisket, of course. Combine beer, catsup, and cranberry sauce in a medium bowl and set aside. Heat olive oil in a large dutch oven or roasting pan on medium high heat. Salt and pepper the brisket and brown it on both sides in the dutch oven - about 5 minutes per side. Remove brisket, turn heat down to medium and add sliced onions to pan. Brown the onions, stirring frequently for about 5 more minutes. Place brisket on onions, then pour beer mixture over brisket. Bring liquid to a boil, turn stove off, cover the pan tightly with lid or aluminum foil, transfer to oven and cook for 2 hours. 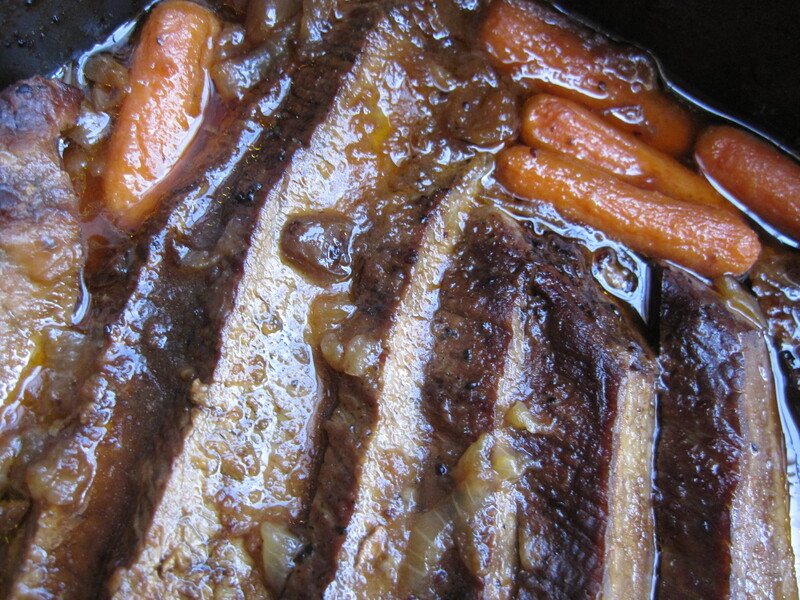 If you would like to cook carrots and potatoes with the brisket (yummy! 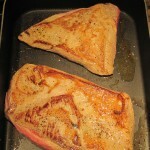 ), add them to the pan, then place the sliced brisket back in as well. Cook for about 1 more hour. 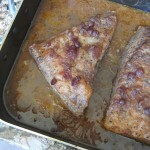 Size of brisket, type of pan, and oven will all affect the actual cooking time. However, you can’t really over cook it and if you check it with a fork and it is easy to grab a piece of a slice, you know you’re good to go. Also, check the carrots and potatoes if you added them to be sure they are fork tender. 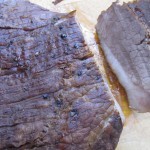 You can now either serve the brisket immediately or let it cool uncovered for about half an hour and refrigerate it to eat up to 2 days later. You can also freeze the brisket for later use. For Rosh Hashanah, serve with a green salad or green vegetable, a luscious kugel, and some sliced round challah and you’re off to a sweet and yummy new year! Sounds delish. I might make this later in the year when we have more people over for dinner as I just got a crock-pot recipe that only uses a 2lb. cut. Thanks. Mmmm, I love brisket. One of he things I love about this time of year is making these big dinners. Time for soups and stews and chilis, yum! Hugs back – hope you are getting a little rest in between newborn feedings! This looks delicious! 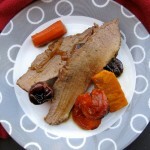 I love the idea of a sweet and savory brisket. Will need to try this one soon. It’s really a nice flavor for ringing in a sweet New Year! Yum, yum, yum. Brisket is already on the menu this week at our house. I might have to try this recipe! It’s wonderful and easy. I’ve been experimenting with another tsimmes-style recipe with dried fruits that husband likes even better! Let me know how your’s turned out.